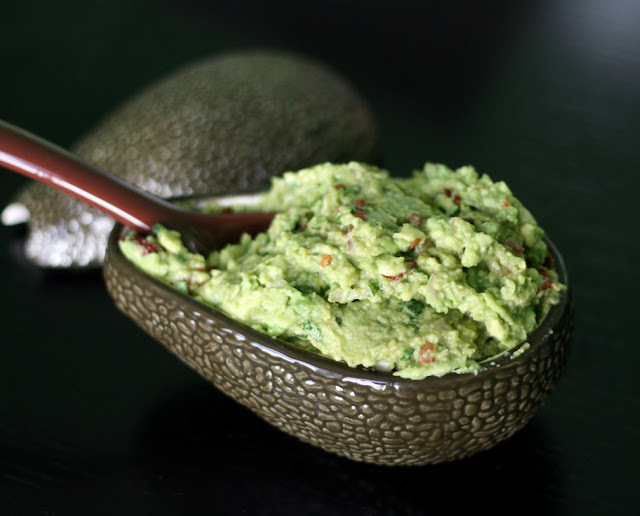 In non-reactive bowl, use the back of a spoon or a potato masher to mash the avocados to desired constancy. Add lime juice and stir to combine. Add all other ingredients, stir to evenly distribute. Cover with plastic wrap, pressing it slightly in to the guacamole to prevent oxidation and chill for at least 1/2 hour. For best results, serve the same day you make it. I've made the same perfectly delicious classic guacamole recipe for years now and thought it might be time for a change. While on vacation we came across the cutest avocado shaped (the spoon is the stem!) guacamole bowl* ever and well, we had to have it. I can't resist anything that is in the shape of something else, especially cooking related items. Anyway, we bought the bowl a week or so ago and ever since I have been looking for avocados on sale. I finally found them for the low(er) but still not so low price of $1.50 each and snatched some up. Since I am all about the smoky, I thought using chipotle peppers in adobe would be fun instead of my usual habanero or bird's eye. I wish I had come papalo to use instead of cilantro (not my favorite herb) but using just a small amount of cilantro lend it some flavor without totally overpowering it. And you know what? Matt says it is the best guacamole he's ever had, even better (gasp!) than the classic version. I also love our bowl, it has a lid and holds the perfect amount of guacamole.